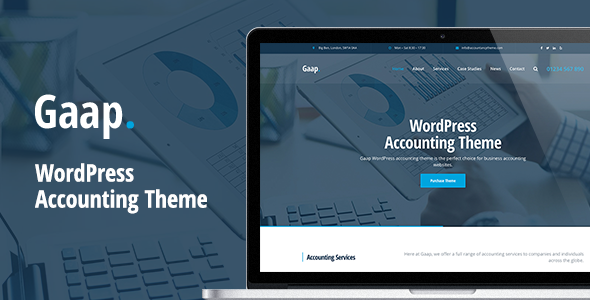 Gaap is the perfect WordPress accounting theme for accountants and accounting companies looking for a clean and professional web presence. With Gaap, SiteOrigin Page Builder and the WordPress customiser, creating clean, modern and professional accountants websites has never been so easy. Packed with over 15 custom widgets that can be dragged and dropped into columns, creating completely unique web pages with Gaap is a breeze. Gaap comes free with an exclusive toolkit plugin which has 5 custom post types and 4 shortcodes. Fed up with complicated theme option panels? No worries, we’ve got you covered. Gaap makes use of the native WordPress customiser, creating options that are super easy to use. What Websites is Gaap Suited Too? Gaap has been tested with browsers IE10, IE11, Firefox, Safari, Opera, Chrome, Edge.